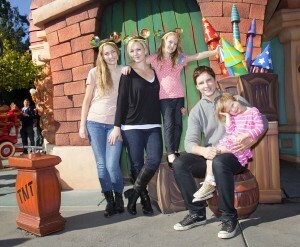 Home » The Facinelli 5 Visit Disneyland! The Facinelli five, mom Jennie Garth, husband Peter Facinelli and daughters Luca, 13, Lola, 8, and Fiona, 4 enjoyed a post-holiday family day on Tuesday at Disneyland. The day at the park was more than likely a nice break for the couple. Peter’s currently filming The Twilight Saga: Breaking Dawn – Parts I and II as well as Nurse Jackie. Jennie has just finished a TV movie, Mulligan, which is scheduled to air sometime in the new year. Tori Spelling and The ‘Guncles’ Treat The Kids To Disney On Ice! Kid Tested: Dance Star Mickey!